I’ve been on a bit of a nostalgia kick as of late, for several reasons. One of the reasons is the fact that we’ve just wrapped up our coverage of this year’s SXSW, which commonly involves a bit of looking back and reflecting on what went down over the week, and which also often leads me to reminisce in general about past editions of SouthBy. And the realization that I’ve been going to Austin every March since 2011 and that the Panic Manual has had a presence there since 2009 gets me thinking about the past, and also that I’m getting old. The main instigator of all this nostalgia however, was a bit of a Spring cleaning jag I went on earlier this week wherein I uncovered a few artifacts from my time here at Panic Manual, including a bunch of old handwritten notes for potential posts. Yes, back in the day I wrote out many of my original rough drafts by hand – very old school of me. Among these scraps of paper, I found the beginnings of a planned review of Baldur, the debut album by Icelandic Viking/folk metallers Skálmöld. I do not really remember ever listening to this album, though I do vaguely remember that when I started out writing for Panic Manual, I had big plans to broaden our scope by writing about more metal. And I guess something about this album caught my attention at the time, probably the Berserker Viking dude on the album cover charging forward while holding an axe. It is a somewhat striking image, and one that predates the premiere episodes of Game Of Thrones or Vikings by a bit, so they were a little ahead of the curve I guess. Anyways, in the interest of not being wasteful, I decided to finish that review up and also delve even further into nostalgia by resurrecting our old Classic Album Reviews series, even though at the time the first draft of this review was started it was a relatively new release. Is Baldur actually worthy of being designated a classic? Not likely, but odds are it might be somebody’s favourite album somewhere in the world, so let’s just go with it. They say you can’t judge a book (or an album) by its cover. But just look at that cover! It’s practically screaming to be judged. And what it’s saying (in a Viking warrior cry) is “I am awesome.” It’s the kind of cover that kind of tells you exactly what kind of music you will be hearing. And that’s it. That’s as far as I got with this review, which indicates that I may have never actually sat down and listened to the album, but that I at least had something to say about the cover image that I considered kind of funny at the time. And so after taking a very long break, I’m finally putting pen to paper (virtually speaking) and wrapping this one up. So what does the album actually sound like? And does it hold up? 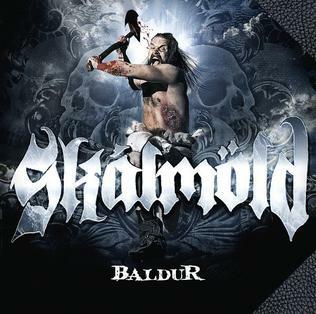 Initially released on Faroe Islands record label Tutl in 2010, but later rereleased in 2011 on Napalm Records, Baldur was Skálmöld’s introduction to the world. The band has gone on to put out four full length albums in the years since the release of this one. I have listened to none of them. But I have now listened to this one at least, and it’s a pretty solid album as these things go. For those unfamiliar with Viking metal, it’s pretty much what you might expect from the name – fairly epic sounding stuff full of Nordic chanting and more aggressive vocals as well as plenty of melodic guitar lines along the way. The Viking aspect is not just a refelection of the band’s Icelandic roots, but also represented in the story behind Baldur, a concept album with supernatural elements telling the tale of the titular Viking and his epic quest for revenge after the death of his family. I gathered as much only after reading about the album online – the lyrics are all in Icelandic, so I’m fairly unclear on all the details. Sounds like a cool story though. After the show, some dude asked me for change, told me he was 79 years old, then asked me if I was some guy named Herman and/or a cop. I told him I wasn’t but he seemed pretty insistent that I was. True story. I wonder whatever happened to that guy. And I wonder if he likes Viking metal.